My last post ( a shameful 6 weeks ago ) began with “It’s been a while…..” and that was only a mere 3 weeks on from the post before that…..I’m now feeling a bit inadequate at this writing game, given that one of the golden rules of blogging is that it should be regular. My apologies, but I do have my excuses. Technology. Last time it was this blog itself which had to be found and bits rewritten after most of it suddenly disappeared. This time was a much bigger issue. After 4 years of disgustingly rude health, our computer died. Just like that. No warning, no coughing or spluttering to help me mentally prepare for its passing. It just died. At first I wasn’t too concerned…I was saddened, of course – after all, my computer and I had become very close friends in our short time together but I still had our trusty little back up box which was there to comfort me in my hour of need. Alas like many insurance policies which catch us out on a technicality when the time comes my little black box failed to pay up. There was no information at all from June onwards and much of the other stuff including more precious photos and documents than I care to mention weren’t there at all. After a few expensive & fruitless visits to the computer doctor we were told that nothing could be done for the back up box and were given a quote for hundreds of euros to try to retrieve the original information from the deceased hard drive. After a few seconds of reflection Amar decided instead that it surely couldn’t be that difficult and after a bit of research bought himself a hard drive reader for the princely sum of 22 €. We now have all of our information, including my extensive photo albums, safely back where they belong – Lazarus, eat your heart out! We also have a shiny new computer system which is proving a bit of a challenge, but we are well on the road to recovery so I’m not complaining.. So for a while, free from the shackles of social media and other such internet phenomena I have turned my attention to other things…. The upstairs barn has finally been decluttered – not that all you minimalists out there would be able to tell,but for me it’s a whole lot better than it was when I wrote this post at the beginning of the year! The walnuts have all been collected a lot quicker than usual…admittedly this year’s weather wasn’t kind to us and the harvest isn’t as good as it should be which is a pity but still, we have plenty. 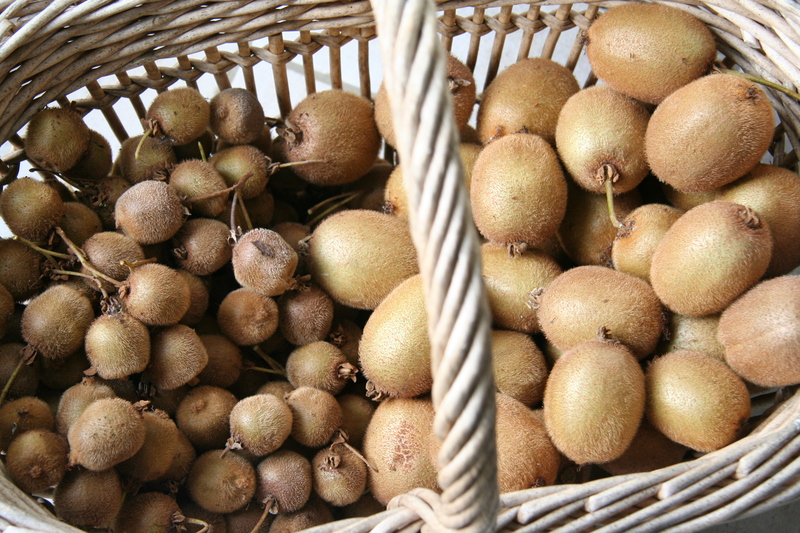 The kiwis have also been picked- they are hard as rocks but we didn’t want to risk them succumbing to the early morning frosts so hopefully they will ripen indoors. We still have a few jars of last year’s smoky kiwi & pineapple jam so I’m not quite sure what we’ll do with this crop. Lots of painting has been going on which otherwise would probably never have been started, including some rooms in our house which shamefully haven’t been touched since we moved in 7 years ago. The irony of the cobbler’s children syndrome has never been lost on me but it’s still taken us all this time to do something about it! 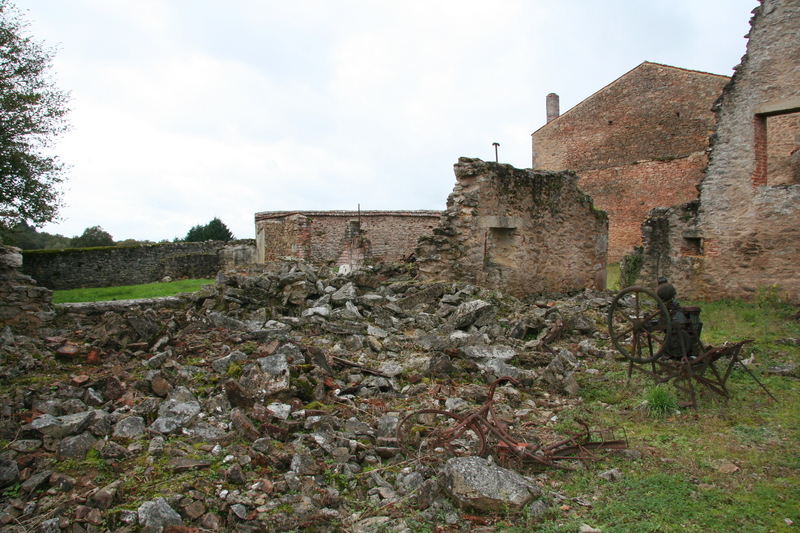 And finally we have been out and about…after talking about it on and off for a while now we at last visited Oradour Sur Glane near Limoges. 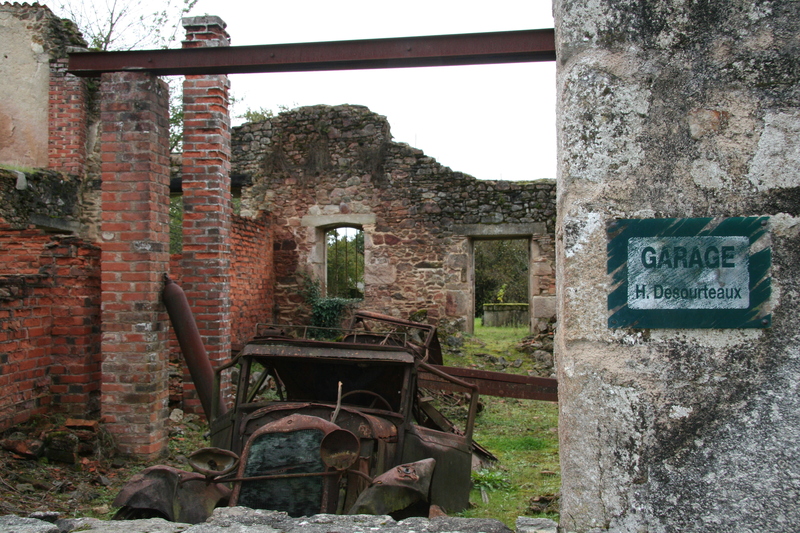 This village was destroyed and all of its 642 inhabitants were killed by the Germans in 1944 – it has never been rebuilt and today it is just as it was left nearly 70 years ago. A strange mix of feeling appalled that these atrocities actually took place, sympathy for those who died and for their families who have had to live with what happened ever since and the detached, almost surreal impression that somehow we were wandering through a deserted film set after the actors had all gone home. I will add some more photos to the Places To Visit page which I’ll be adding here just as soon as I’ve finished the painting…. hopefully it won’t be too long! You really are a great blogger Elena, amongst all the other talents! 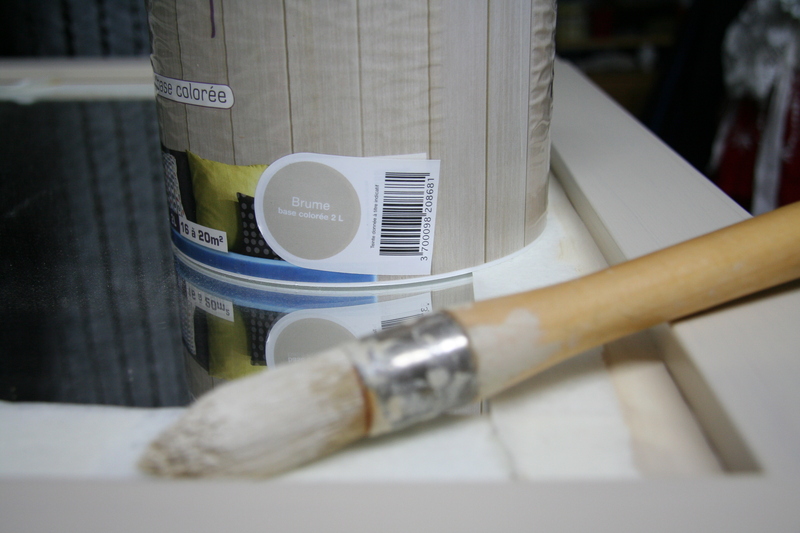 It is so nice to see that Le Crouquet (as we called it!) is in the very best of hands! You both deserve every success! 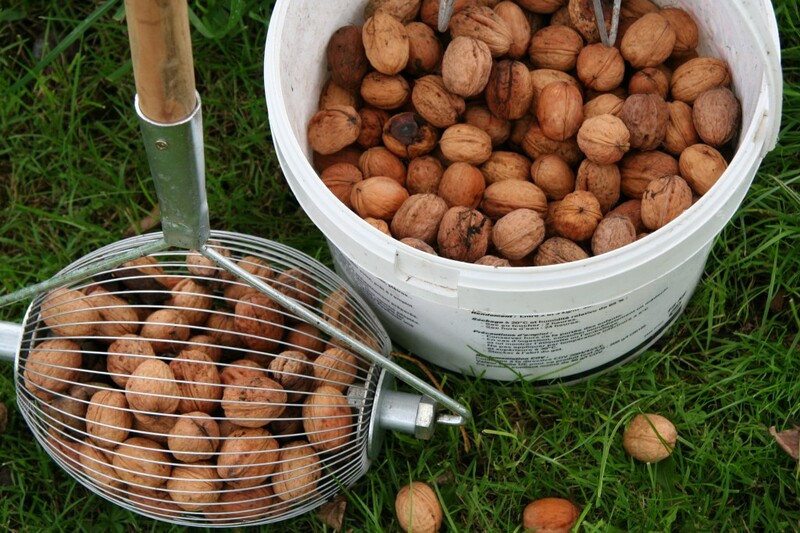 great harvest you’ve got there… is that basket to clean the walnuts? Thanks for the heads up on the link, Elisa! There was an extra http:// in there…it’s working now! Our external hard drive was suppose to be our safety net but what a coincidence it all went wrong at the same time..getting paranoid now & will probably back it all up 4 times just in case!! The basket is a great gadget originally designed for collecting golf balls but now used by all the locals for collecting nuts. Just roll the cage over the ground & it picks them all up easily.No bending down so no more sore backs..can’t recommend it enough!! 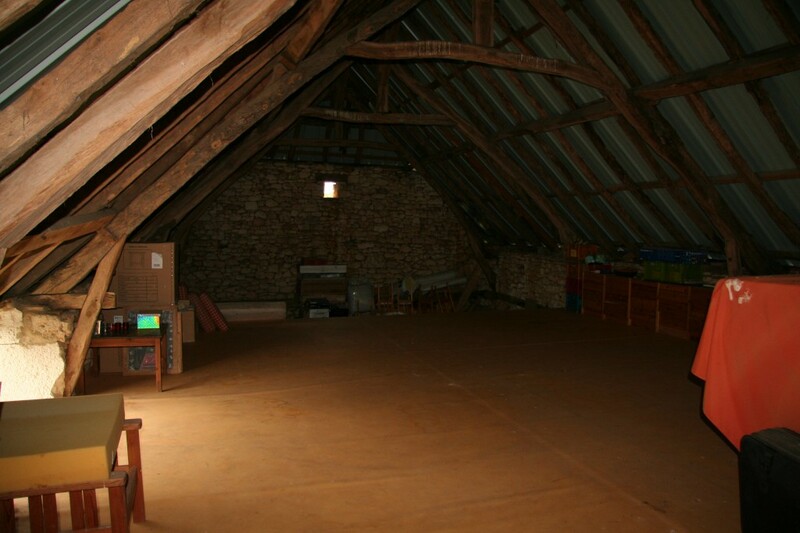 I want that barn attic – it would make a fabulous bedroom. What is that strange wheely thing for? Shaking up the walnuts’ brains? (Trying desperately not to link up to the squirrels in Charlie & the Chocolate factory… opps, done). Sorry to hear about you pooter, and hooray to Amar for his clever thinking!! Your photo of the rusting car waiting for an owner who will never return is sadenning… I hope that makind will learn one day. The strange wheely thing is the best thing I’ve bought in a long time!! See Walnuts & Wisdom Teeth for full explanation!! Seen and sussed. What a clever idea!